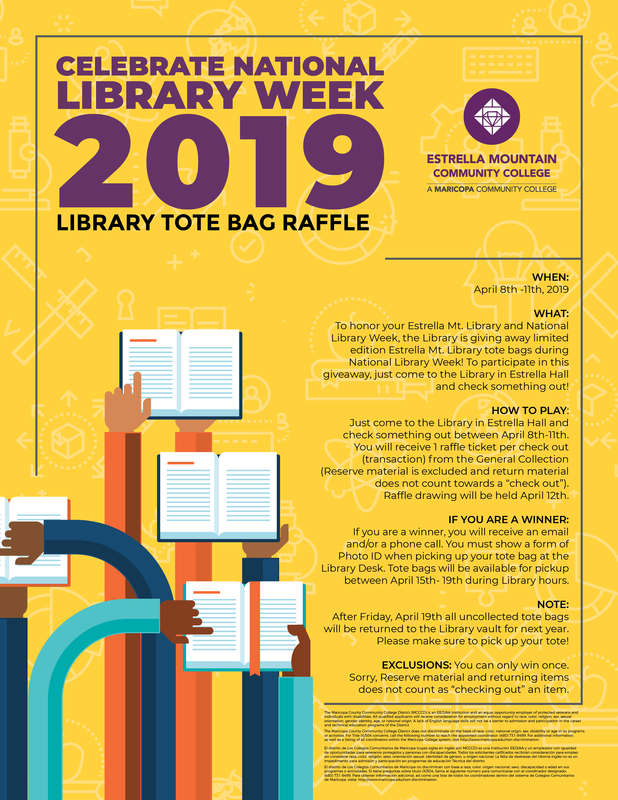 In honor of National Library Week, the Estrella Mountain Community College (EMCC) Library is holding its first ever National Library Week Tote Bag Raffle. The raffle will take place from April 8 to 11. All it takes to participate is going to the library and checking something out. Participants will receive one raffle ticket per checkout (transaction) from the General Collection (Reserve material is excluded and return material does not count toward a checkout). The drawing will be held April 12. Lucky winners will be notified by email and/or phone. Winners must show a photo ID when picking up their limited edition tote bags at the library desk. Tote bags will be available for pickup April 15-19 during normal library hours. The library is located on the ground floor of Estrella Hall. According to the American Library Association (ALA), National Library Week is an annual celebration highlighting the valuable role libraries, librarians, and library workers play in transforming lives and strengthening our communities. This year’s theme, “Libraries = Strong Communities,” illustrates how today’s libraries are at the heart of our cities, towns, schools, and campuses, providing critical resources, programs, and expertise. They also provide a public space where all community members, regardless of age, culture, or income level, can come together to connect and learn. According to the Columbia Encyclopedia, the earliest known library was a collection of clay tablets in Babylonia in the 21st century B.C. The first Roman libraries were brought from Greece, Asia Minor, and Syria as a result of the conquests in the first and second centuries B.C. Early Christian libraries were found in monasteries. Arabs collected and preserved many libraries in the ninth to 15th centuries, and Jews and Byzantines also developed fine libraries during the medieval period. Although it is common to mention the prominence of the oral tradition in African nations to justify the assertion that books were uncommon, the anthropological information currently available does not support that. In fact in Timbuktu, which was founded around AB 1100, the most profitable trade items were books. Buying books and creating libraries was a way to demonstrate wealth and social standing. In the U.S., the first public library opened in 1653 in Boston, and a circulating library known as the Library Company of Philadelphia was chartered in 1732 on the initiative of Benjamin Franklin. The first tax-supported library in the country opened in 1833 in Peterborough, N.H. The ALA was formed in 1876 and spurred improvements in library methods and the training of librarians. Libraries in the United States and Great Britain benefited greatly from the philanthropy of Andrew Carnegie, who gave more than $65 million for public library buildings in the U.S. alone and strengthened local interest by making the grants contingent upon public support. Among the innovations of the late 19th century were free public access to books and branch libraries or deposit stations for books. In the early 20th century, traveling libraries, or “bookmobiles,” began to take books to readers in rural or outlying areas. By the end of the 20th century, the digital revolution had resulted in many resources being available to library patrons in electronic formats. Not all libraries are equal. Three major types of libraries exist in the U.S.: public, academic, and school. EMCC’s library falls under the academic category. According to the ALA, students’ academic success is linked to library usage, including improved retention and an enhanced academic experience. Maricopa Community Colleges libraries offer several perks to students including the ability to check out some textbooks. “Just tell us your instructor’s last name and the title of the book,” Rodriguez said. Other perks include the ability to use all 10 Maricopa Community Colleges libraries and the 24/7 “Ask a Librarian” feature at my.maricopa.edu/ask-a-librarian.